Playa Nicuesa has been recognized for its commitment to a clean beach and environmental consciousness in its community by receiving the Blue Flag. Costa Rica has expanded the Ecological Blue Flag Program, which started in in Spain, to include many categories with the purpose of verifying the implementation of activities in communities and schools that contribute to the protection of water sources, forests and coastlines. Playa Nicuesa has been participating in the beaches category of the Blue Flag Program for over a year now. 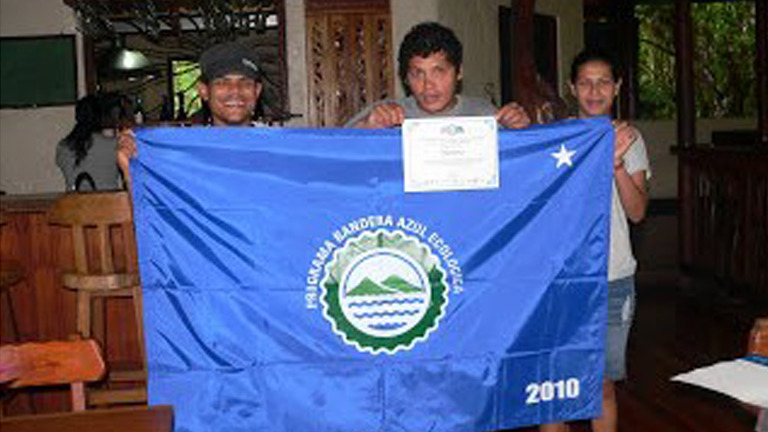 To receive the Flag the hotel must test quality of drinking water as well as ocean water, coordinate beach clean ups, ensure a responsible waste management system in the community including garbage bins along the coastline, educate the community about the importance of water and other environmentally related topics and regularly inspect the coastline to ensure there are no industrial or domestic discharges. The motivation to participate in this program came from a few employees that began to gather garbage that washed up along the beach in their free time. Now they have expanded that initiative and have educated the community on a wide variety of topics related to water, planned beach clean ups in our own backyard as well as in several neighboring beaches. Even guests have gotten drawn into the fold by joining in on beach clean ups and learning how garbage arrives even on pristine and protected shorelines.